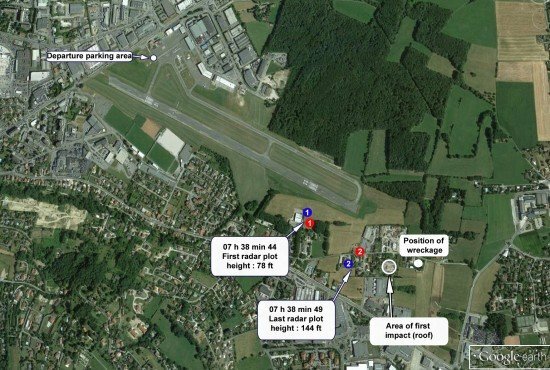 The French accident investigation bureau, BEA, recommends EASA to study the possibilities of ground ice detection systems following the fatal accident involving a Premier 1A corporate jet in March 2013. The Hawker Beechcraft 390 Premier IA jet, registered VP-CAZ, was parked overnight on the platform at Annemasse Airport in France. The temperature was -2°C and humidity was 98% with fog or low clouds as the pilot prepared for a 5-minute VFR flight to Genève-Cointrin Airport (GVA). One passenger was seated in the cockpit, another passenger was seated in the passenger cabin. The pilot started the takeoff from runway 12 at 08:38. Rotation occurred 19 seconds later. Several witnesses reported seeing the airplane with a high nose-up pitch attitude, with a low rate of climb. Three seconds after the rotation the “Bank Angle” warning, indicating excessive bank, and then the stall warning, was recorded several times on the cockpit voice recorder. Several witnesses saw the airplane turn sharply to the right and then to the left. Fifteen seconds after the rotation, the left main landing gear struck the roof of a house about 500 m from the threshold of runway 30 at Annemasse. The aircraft then collided with the ground. During the impact sequence, all three elements in the landing gear and the left wing were torn away from the rest of the airplane. It then slid along the ground for a distance of about 100 m before hitting a garden shed, a low wall and some trees in the garden of a second house. A post-impact fire erupted. Both occupants seated in the cockpit were killed.